We recently heard a shocking story that highlights how prevelant superstition, witchcraft and animisim are here in Zambia, even in a city like Lusaka. Friends of ours have four children, are strong Christians - the father is a pastor and is well-travelled, they are well educated and committed to strong Biblical teaching and building up the church. Just over a week ago they were asked to come to their youngest son's school, he is 13 years old. They expected it to be about his performance in a particular subject and were surprised when so many staff were there ready for this meeting. It turned out that their son had shared his lunchtime drink with a friend and that this boy had gone home and allegedly suffered terrible dreams which in turn his parents ascribed to the 'fact' that he had been cursed. The curse was believed to have been cast by our friends' son and because it was so strong the conclusion was that the father (ie our pastor friend) was involved too. The worst is yet to come. This innocent 13 year old boy was pressurised into signing a confession by the teachers that he was practicing satanism and had cursed his classmate. Unbelievably, this is not a private school but a government run secondary/high school in one of the nicest parts of Lusaka. This has obviously been a very testing time for our friends and they are, not surprisingly, moving their son to a different, non-government school. It also demonstrates how in Zambia, as a 'christian country' such evil practices and beliefs lie just under the surface in all walks of life. The last few weeks have been terribly hot, but beautiful too, as some of the trees burst into flower. The colours here are fantastic and here is my favourite. 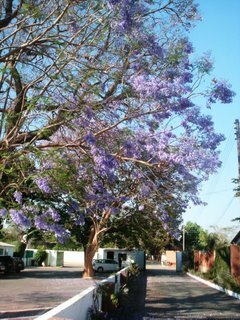 This is the Jacaranda tree that sits in the middle of the car park/parking lot at the school that Philip and Rachel attend. As we walk to and from school each day the road we go along is lined with these trees that form a beautiful purple parade. 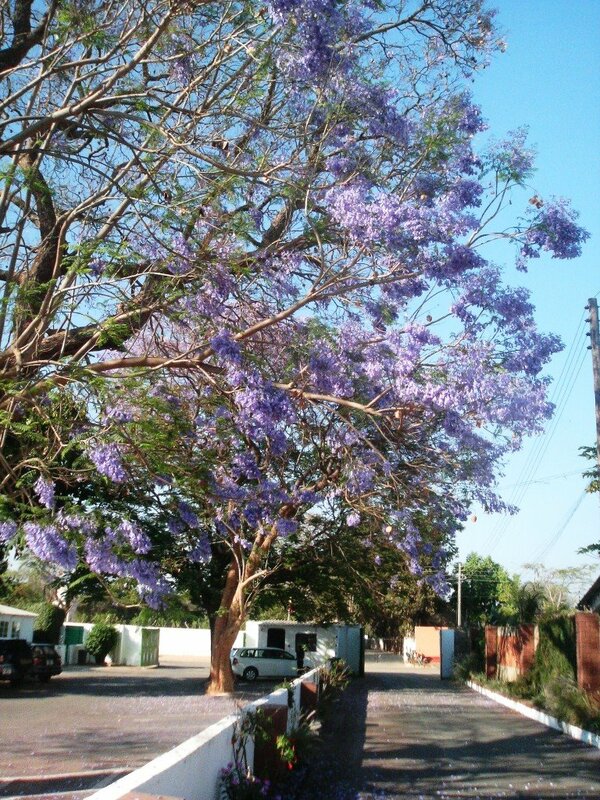 Often as you look around in Lusaka there is rubbish by the side of the road, people in desperate straits and the signs of a country where over 80% of the population live below the poverty line but you look upwards and you see the beauty of the jacaranda tree.